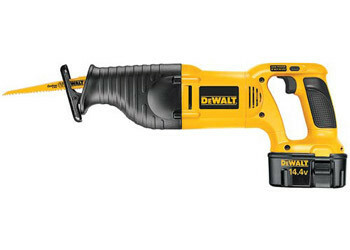 Dewalt Heavy-Duty 14.4V Cordless Reciprocating Saw Kit. Keyless blade change allows quick blade change without touching blade or reciprocating shaft. 7/8" stroke length and 0-2,700 spm for fast cutting. Electric brake reduces coast time. Compact and lightweight; 6.0 lbs. Blade reverses for upside down cutting. Variable speed with trigger lock for more precise cutting.